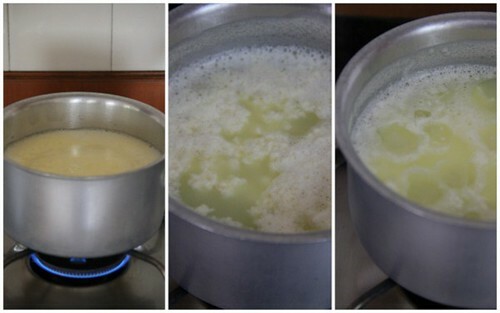 Boil milk in a wide kadai stirring every now and then allowing not to stick to the bottom and mixing along the cream forming on top, until it thick and reduced to almost half. Add the nuts and cardamom powder. Simmer in low heat for not more than 3-5 minutes . Switch off fire ending with the addition saffron strands. Boil milk and curdle using vinegar. Dilute a tbsp of vinegar with a tbsp of water. Lime juice works fine too. But I feel vinegar does a better job separating milk solids from as strongly acidic. 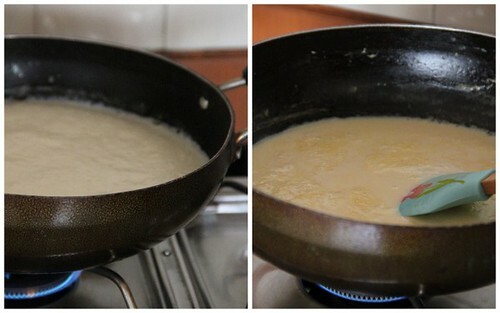 Stir along vinegar over the simmering milk and you see the milk curdling instantly. Switch off fire and add a few ice cubes to the pan. This is to prevent further curdling and to achieve the softest cottage cheese/paneer. Transfer the hot mixture on to a colander lined with cheese cloth. Wash the cheese with running water to remove any acid sticking onto it. Gather the edges of the cloth and folding like a money bag, squeeze out the water gently as much as possible. 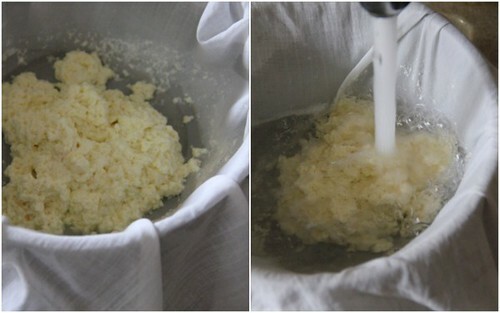 Tie the bag and hang it carefully to drip the whey fully out for at least 30 minutes - 1 hour. 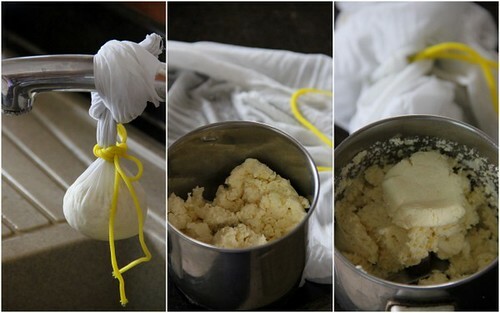 Open the cloth bag, transfer the paneer to a mixer and pulse, to get an extra soft cheese. This is very important to get a soft cheese which has no split borders once shaped out. Take small portions, roll out into smooth balls in your palm, flattening a bit by pressing gently in the centre on one go while you roll. 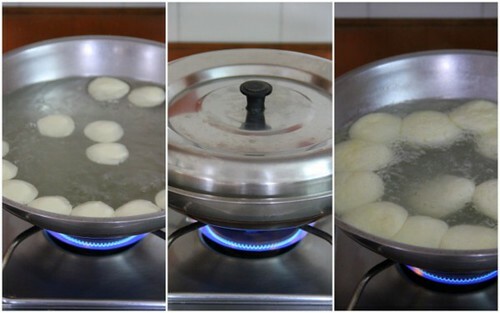 While you do this, you can simultaneously boil 6 cups of water and 1 cup of sugar in a broad wide kadai. 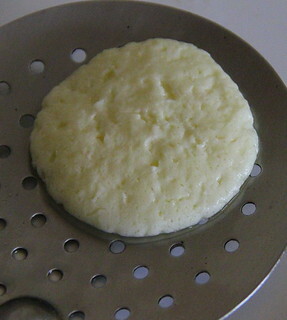 After it rolls and boils, slip the flattened cheese / rasagullas one by one, carefully. Remember to use a kadai/pan large enough to give space to the rasagullas as they double in size when cooked. Close it with a lid. Let the flame be medium to high so that the water continues to roll and boil for another 6-8 minutes. Open the lid during half way and pour a cup of hot water if you feel the sugar syrup has turned thicker. We want a thin liquid to get the rasagullas cooked. After 8-10 minutes you will find them cooked. See how they have expanded! To test whether cooked, the soft and spongy rasagulla springs back to its shape if pressed gently. Switch off fire. Fish them one by one using a flat slotted ladle and press gently to squeeze out the sugar syrup. The holes thus evacuated absorbs rabdi. Dunk in the hot rabdi. You may do a taste test of sweetness at this point and may add sugar if needed. 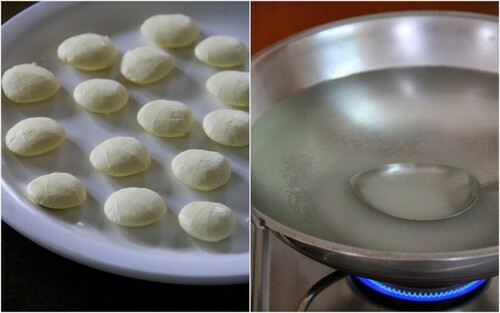 You can start making the rasagullas first. 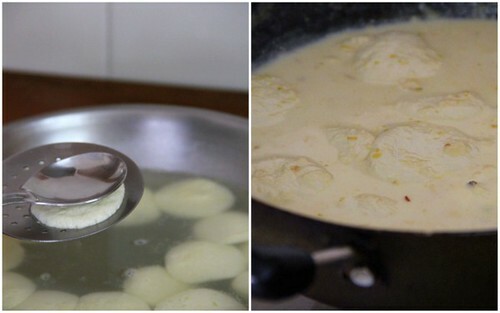 Proceed making the rabdi when you give time for the hung paneer to drip out liquid completely. 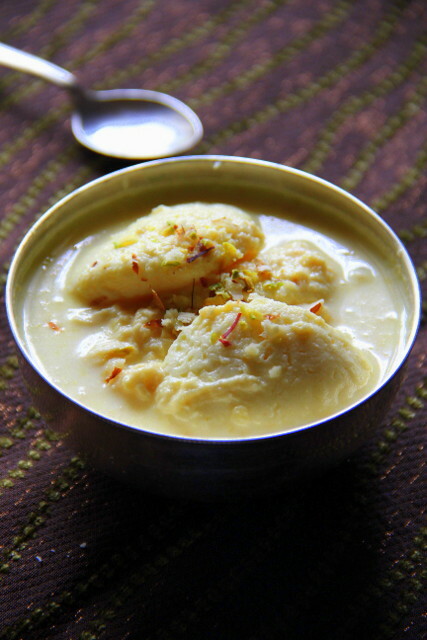 If you make Rasmalai in larger quantities you can make rabdi and refrigerate until the next day while you can make the rasagullas relaxingly. Refrigerated rabdi is thicker and creamier. The nutty flavour mingles well with the flavour of cardamom and the colour as well as the unique flavour of saffron. Store chilled and tastes best if consumed within a day or two. This is Shyama and hans (one of )favourite indian dessert, looks so good. Wow...I love these irresistible Rasmalai...Its one of my fav Indian sweets...Kudos to you as you made it from scratch!! super yummy! this tempts me to make tomm!! Happy Diwali!! I made the same here for diwali! yay! good to have company albeit a long-distance one :) My work was cut short since I bought the paneer and pulsed it in my processor. I am always looking for short-cuts and hey, if it works out well, who is complaining, right? 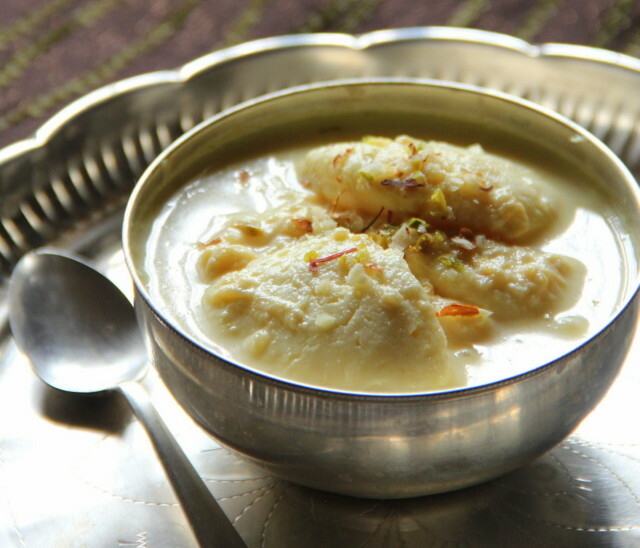 Who can resist to this fabulous rasmalai, prefect for my sweet tooth. so yummy and delicious!! they have come out very very good!! by seeing itself i can say its divine wonderful photography ! You've made it look so easy!Planning to take the easier route,of using rasgullas to make rasmalai for bhai dooj.Have a safe and happy Diwali! I am one of those few who have never tasted rasgulla and rasmalai. I made an attempt to make gulab jamun at home and it bombed miserably, but I really want to attempt again for Diwali. I am bookmarking this. 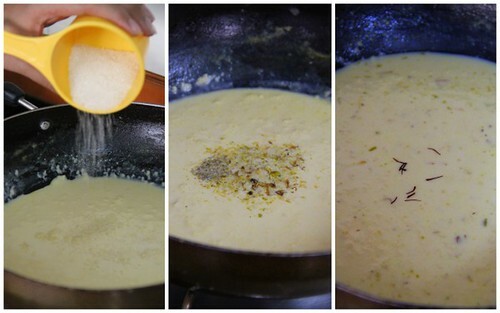 Your Rasmalai looks so delicious, it looks like saffron-flavoured ice-cream. It has been on my to-do list for a long time but when I try, I will let you know. I'm having some trouble pinning these pictures. Do you know why? My mom loves this. It looks so mouthwatering. Delicious! 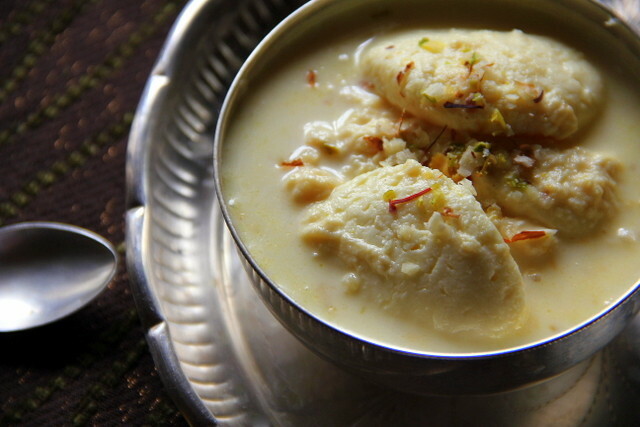 Rasmalai in your pictures are so tempting and intensely rich. This is my son's favorite dessert. When I make them, we used to shamelessly indulge in gulping them as if in a competition. You have reminded of all the pleasure those spongy disks in sweet, creamy milk gives. Thanks a lot!